Je suis veru en Afrique du Sud quard J ovosis 12 ons (I came to South Africa when I was 12 years. 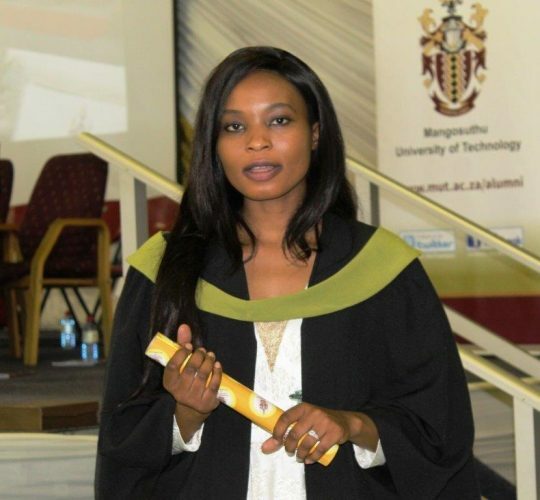 So said Mbole Ntunka, a Democratic Republic of Congo (DRC) national who graduated with a Diploma in Chemical Engineering. Ntunka is one of many international students that graduated during the Faculty of Engineering ceremony on Wednesday, 10 April 2019. Mbole, who comes from the DRC’s Lubumbashi, one of the big cities in the DRC, said she came to MUT because she believed the University offers better qualifications. Mbole is now a research assistant at the UKZN’s Howard College campus where her brother is a lecturer. Another international student that graduated was Hermenegildo Dos Santos Fernando. Gil, as he is affectionately called, graduated with a Diploma in Electrical Engineering. Gil (26) is from Angola’s capital, Luanda.